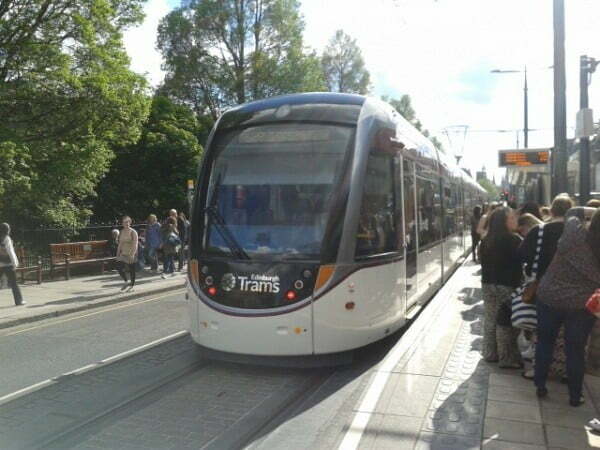 Edinburgh’s trams opened for business last weekend after 6 years in production and a total spend of £776 million. The first tram set off at 5.30am from the Gyle Centre stop on Saturday morning, where 200 people had been waiting to board. The trams provide an easy and efficient means of transport between Edinburgh Airport and York Place in the city centre. Their smooth riding experience has earned plaudits from passengers, and they have low-floor entrances for disabled access, as well as dedicated wheelchair spaces and priority seating (mobility scooters, however, are not permitted aboard). They also offer unique views of landmarks such as Edinburgh Castle, Arthur’s Seat, Carrick Knowe golf course, Gogarburn Bridge, and the Gogar Kirk. They are roughly equivalent in speed to buses, but have better green credentials. The first tram ride of the day leaves the Gyle Centre for York Place every morning at 5am, with the final full journey leaving York Place at 11.08pm (later journeys leave at 11.18 and 11.28, but don’t reach the Gogarburn, Ingliston Park and Ride, or Edinburgh Airport stops). The first journey from Edinburgh Airport leaves at 6.15am, with the last setting out at 10.45pm. On Monday to Saturday, trams run every 8-10 minutes, with a longer interval of between 12-15 minutes on Sundays. Adult Single tickets cost £1.50 for travel within the City Zone (all stops excluding Edinburgh Airport), and 70p for a child. Travel to and from Edinburgh Airport (the Airport Zone) costs £5.00 for an adult and £2.50 for a child. Edinburgh Trams, as part of the new integrated Transport for Edinburgh group, is linked with Lothian buses through a number of shared services; for example, DAYtickets provide unlimited travel on both buses and trams for a day, and cost £3.50 for an adult travelling within the City Zone, and £9.00 for the Airport Zone. The fares for a child are £2.00 and £4.50 respectively. Return tickets (which include both the Airport and City Zones) cost £8.00 for an adult and £4.00 for a child, and a Family DAYticket (City Zone only), which admits up to 2 adults and 3 children, costs £7.50. Weekly, monthly, and annual travel passes are also available.